Alright, this is where we get a bit technical. After going through the process of creating dance in Part 3 it’s time to talk about choreographic devices. Choreographic devices are the tools we use to manipulate movement in order to enhance, exaggerate and embody actions. They’re a great way to give a class or a group of children ownership over their dance. These first four are what I would call your starter pack and are best suited with EYFS and KS1. They can of course be used with KS2, before moving onto more experimental devices. How fast or slow the movements are being performed. Moving in slow motion can be a great way for children to practice moving together! Speeding things up allows for repetition of movements. How big or small the movement is. Everyone performing the same action at the same time. Movements being performed one after another. This can be as simple as one group starting, and then the other group starting or a room full of sixty students performing one action immediately after one another until everyone has had their turn. Repeating the same movement or phrase over and over. How many people are moving at the same time? The whole class? Groups? Pairs? Solos? Performing movements backwards by reversing the actions of a phrase or sequence. Kick, step, turn - turn, step, kick! Can the same action be performed by a different body part? Or can a different body part lead the action? Link this with repetition - can the same move be repeated using a different part of the body? Which way are you facing when performing particular moves? Are they all to the front? Facing the back? On a diagonal? When and why do they change? It may sound silly, or an easy cop out but stillness is a device indeed! When repeating a phrase, might there be a section where you skip a few moves and are still instead? What can that represent? When the music’s at its loudest, juxtapose it with stillness? What does that show? Using pairs of all the above devices to oppose and contrast each other. Big vs small, fast vs slow, a group vs a solo etc. KS2 kids especially can go to town with these! However, it’s facilitating them effectively that makes this a productive process. 'How do I facilitate this effectively?’ I hear you ask! 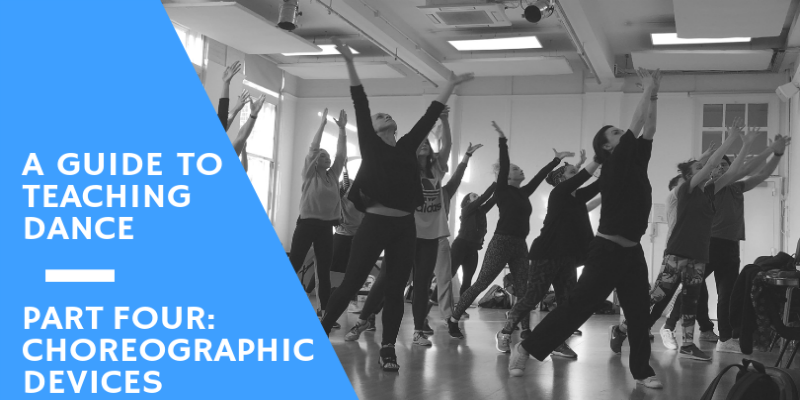 Learn how next time, in the final part to our Guide to Teaching Dance!